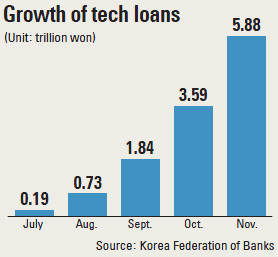 Loans under the government’s “technology finance” initiative have reached nearly 6 trillion won ($5.4 billion). A start-up created last September has a patent on enriching and refining waste produced in the manufacture of computer chips. It is the first such technology in Korea, but the company lacked the collateral required for bank loans and was unable to secure the capital needed to build production facilities. But the start-up recently took out a 1.3 billion won loan from Shinhan Bank after the Korea Technology Finance Corporation (Kibo) and the bank conducted due diligence on the company and evaluated its technology. In addition, the technology-based company received 500 million won for management. Thanks to the loans, the start-up signed a contract with a conglomerate and expects about 1.5 billion won in annual revenue.